The Kremlin’s domestic and foreign policies are aimed at minimising global turbulence and reducing its risks as much as possible. Prior to President Vladimir Putin’s address to the Federal Assembly, the first since his return to the presidency, sources in the Kremlin predicted that he would pay significant attention to national security issues. Those who prefer strategic issues such as defence and foreign policy were disappointed, because Putin was terse on these subjects. However, the sources were correct: Putin's speech focused on national security, but he took a new approach. Since his election articles published in January and February, Putin has been pushing one and the same idea, albeit in different forms. That is that the world around us is dangerous and unpredictable, and that matters are only getting worse. Mutual dependence and permeability are extremely high, it is impossible to cut yourself off from what is happening elsewhere. Foreign and domestic events are interconnected, and external instability interacts with domestic problems, exacerbating both and that acts like a turbulence funnel. The Kremlin’s domestic and foreign policies are aimed at minimising this turbulence and reducing the risks as much as possible. Putin had many good words to say about the government's civil responsibility and accountability to the public. He criticised government officials and emphasised that they should set an example. Obviously, statements alone will change nothing, but the fact that this issue has been raised is, in itself, important. Although Putin noted the importance of “restructuring,” because development is impossible without change, he also emphasised the essential role of the social and cultural aspects. “Our neighbours and partners should need us. I want to emphasise that this is important for Russia. This concerns our economy, culture, science, education and diplomacy, especially the ability to organize collective efforts on the world arena…” he continued, adding: “And, last but not least, this concerns our military might, which guarantees Russia’s security and independence.” “We should press forward and strive only for the future.” This statement builds on what Putin wrote in his election articles, when he stated that the post-Soviet era and its agenda are over. 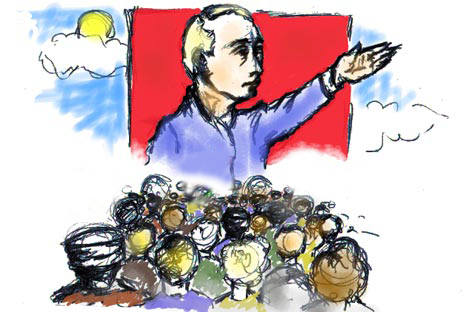 It is no secret that, for almost 20 years, the leitmotif of Russian policy was to overcome the trauma caused by the Soviet Union’s disintegration. This policy has its pluses and minuses. However, this time Putin emphasised that Russia’s history did not start in 1917 or 1991, and that the nation should rely on its more than millennium-old history.